Chapman’s Peak Drive is a 9km toll road and scenic drive on the Atlantic Coast linking the communities of Hout Bay and Noordhoek. The route with its many curves skirts Chapman Peak, the 593m high southerly extension of Constantia Berg, and follows the rocky coastline to unfold breathtaking views in both directions. Apart from providing locals with an alternative and convenient access route between Cape Town and the South Peninsula it offers much more to visitors and tourists. The various viewpoints and picnic spots encourage people to make the most of their trip and the breathtaking scenery encourages photography and sightseeing. 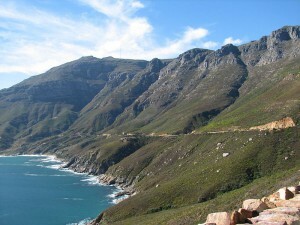 In short Chapmans Peak Drive forms the gateway between Cape Town and the South Peninsula.